On April 4, 2019, The Watertown Community Foundation and Watertown Middle School PTO will hold a special screening of the documentary at Watertown Middle School auditorium to open up a dialogue between local families, community leaders and experts. The event will feature a viewing of the 56-minute film Producers Scilla Andreen and Karin Gornick have one goal: to start a global conversation and raise awareness around anxiety. Through candid interviews, they utilize the power of film to tell the stories of many kids and teens who discuss their anxiety and its impacts on their lives and relationships, as well as how they’ve found solutions and hope. The film also includes a special interview with Michael Phelps, a mental health advocate and one of the greatest athletes of all- time. In addition, the documentary provides discussions with mental health experts about the causes of anxiety and its sociological effects, along with the help, resources and tools available to address the condition. On Wednesday evening, March 20, 2019, the Watertown Youth Coalition Peer Leaders had their theatrical debut in a skit called “Welcome to Rehab”, which was written as a collaboration between the Improbable Players and Peer Leaders, and directed by Andy Short. This impactful performance depicted what addiction to substances can look like for both teenagers and adults, and how it affects the important people in their lives. Following the act, the Peer Leaders facilitated discussions around substance use, racial equity, sexual and gender identity, and mental health. These topic areas were drawn from quotes of attendees of the 2018 Town Hall meeting. Did you know you could race a sculpture? Hatch is joining the fun at the annual Community Sculpture Racing event at Danehy Park in Cambridge on April 20th. Come assemble a racing sculpture on April 16th to represent Hatch, the WFPL, and Watertown! Open House and Maker Expo! ARMENIAN MORNINGJoin us for a morning filled with Armenian history, music, culture, and food. Join other Armenian speaking people in a comfortable setting. Learn what resources are available to you. WHEN: Wednesday, April 10, TIME: 10:00 AM Pre-registration Required as seating is limited. The latest episode of Inside Watertown featured Tammy McKenna, second from right, and Gina Nolan, from the Commander’s Mansion. 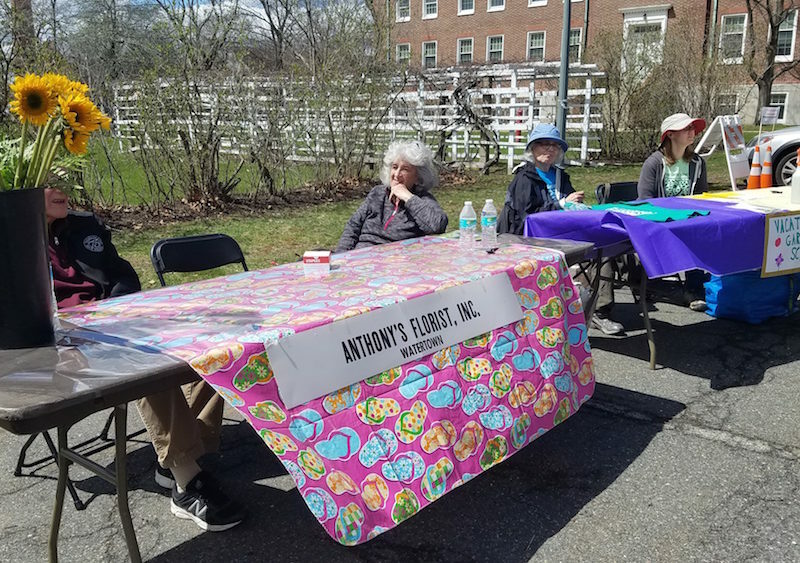 Co-hosts John Airasian, left, and Charlie Breitrose spoke with them about all the events at the town-owned historic home. Find out about all the things that go on at Watertown’s own historic mansion on the latest episode of Inside Watertown. The Watertown Cable show highlights the town-owned Commander’s Mansion, located in the historic Watertown Arsenal. Co-hosts Charlie Breitrose and John Airasian welcomed Tammy McKenna and Gina Nolan, who run events at the home. The Watertown Community Foundation’s annual volunteer day is coming up, so mark your calendars. The sixth annual Watertown Helps Out will be held on Saturday, May 4, 2019. That day volunteers will head to locations around town to do work with local non-profit groups on projects in the community. For more information go to www.watertownfoundation.org. Vacation Garden School inspires children to claim their role as caretakers of water, soil, seed, animals, and harvest. Through hands-on learning, art and story, song and silence, children grow in wonder and skills. Vacation Garden School is offered by the Church of the Good Shepherd, 9 Russell Avenue, Watertown. Campers (ages 4-7) come from 9:00-11:30 a.m. Each one is paired with a junior counselor buddy, who accompanies them through the week, helping them stay safe, have fun and learn.